the bulk of the submissions and entries are located. Senior Airman Andrew Golembiewski is currently serving in Ft. Walton Beach, Florida and was promoted to Senior Airman on November 25, 2005. S/Sgt Paul Golembiewski, United States Air Force, is being deployed to Iraq for four to six months beginning in mid January 2006. Please keep him and all the soldiers in your prayers. Pvt 2 Woodring is second from the right in the photo on the right - Click photos for larger view. 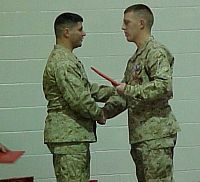 Purple Heart recipient Lance Cpl. Michael Mehltretter, "for wounds received in action." Click last two photos for larger view. Lance Cpl. 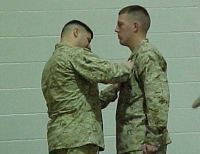 Michael Mehltretter, one of 14 United States Marines with the India Company of the 3rd Battalion, 25th Regiment, based in Buffalo, N.Y., received the Purple Heart on Saturday, December 17, 2005, "for wounds received in action on 4 September 2005 in Iraq." 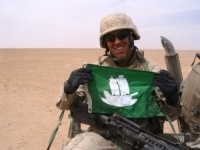 He spent seven months in Iraq returning home on October 6, 2005, with a war injury, but with no complaints of the constant danger he and his comrades were in. One Marine in his group made the supreme sacrifice. 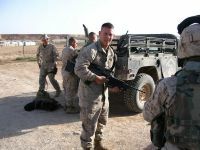 Shortly before he was to leave Iraq for home on Grand Island, Michael was injured when a car drove through barriers into his base camp and blew up. 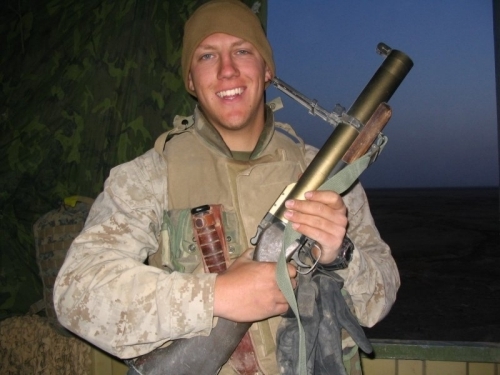 For a Buffalo News story by Maki Becker about the Grand Island High School graduate, Class of 2002 and the 14 other Marines, click "Lance Cpl. Mehltretter". For photos of Mike taken in the spring of 2005, click "Mehltretter Photos"
The Purple Heart, as described at http://www.purpleheart.org/explain.html, is an American decoration - the oldest military decoration in the world in present use and the first American award made available to the common soldier. It was initially created as the Badge of Military Merit by one of the world's most famed and best-loved heroes - General George Washington. It was nearly three years ago, in 2003, that we created this page especially for Islanders who are serving in the armed forces overseas (or in the states). We encourage closely related relatives to submit the name, email and/or U.S. mail address, rank and service of their loved one to teddy@giecom.net. We will gladly post a photo along with a short note on where your relative or friend is at this time. Won't you please take the time to write and tell our troops how proud you are that they have volunteered to protect our country? Come back to this page often, as additional names and addresses will be added as they are submitted. SPC Corey Burke, son of Mr. and Mrs. Dave Burke of Panama City, Florida, returned from Iraq last month to his new assignment at Ft. Benning, Georgia. Corey is the grandson of the late Roy and Marge Dinsmore and nephew of Dan and Laura Dinsmore on East River. He appreciates all the thoughts and prayers of Islanders during his stay. Sarah McMahon, serving at Camp Victory in Iraq with the US Army, was promoted to 1st Lieutenant on Friday, November 25, 2005. CPT Jackie Waddell was the promoting officer and CPT Chad Rising, shown with Sarah, is her company commander. Sarah is the daughter of Karen and David Conboy of Grand Island and Tom and Nadine McMahon of Springfield, Virginia. My apologies for the lack of updates recently. It has been a challenging year thus far for the 173rd Airborne. The warm weather brought the Taliban from their haven along the Pakistani border resulting in a lot of action for our infantrymen this summer. Although we have already lost more soldiers than our year-long tour in Iraq, the number of insurgents killed is much higher, especially here in the south. I was lucky enough to be located at a forward operating base for four months of this tour. My treatment team and I working closely with a forward surgical team, cared for many of the local national surgical and trauma patients who were beyond the capabilities offered at the local hospital in a nearby town. We also stabilized many of those wounded in combat, to include US, coalition, ANA (Afghan National Army), and enemy combatants. Although we are eager to return to Italy next spring, we understand that there is much to be done towards making this country a safe and democratic state. If you could, please pass on my thanks to those who have supported the troops downrange, especially Joe Synakowski and the kind ladies of the VFW Auxiliary who put together a great package for us (great rum balls!!). I have included a picture from a forward operating base depicting the off-loading of a trauma patient. Hope all is well back on the Island. August 18, 2005 . . .Isledegrande.com has been notified that letters may be sent to Lance Corporal Michael Mehltretter until September 1, 2005 and Motomail until September 15th. However no more packages are to be sent to LCpl Mehltretter. Click for "Mehltretter Address". August 11, 2005 . . . On 10 Aug 2005 at 1400 Zulu, The United States Air Force announced that SrA Brent M. Helman had been selected for promotion to the rank of Staff Sergeant/E-5. He holds a line number of 11,508. Out of over 30,000 eligible Senior Airman, the US Air Force only promoted just over 14,000, with a promotion rate of 40.14%. With his current line number, Brent should sew on his 4th stipe in June/July 06. 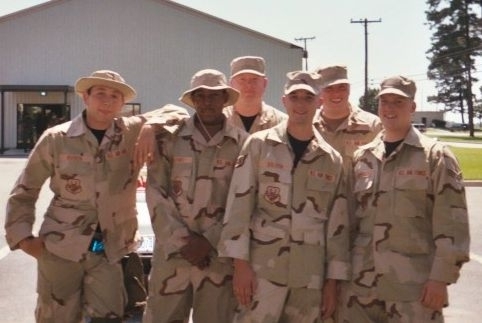 June 2005 . . .Paul Michaud, GIHS Class of 1995, is currently a physician in the U. S. Army and recently graduated from his internship at Eisenhower Army Medical Center on June 10. During the ceremony, Paul was recognized for his research entitled �Ovarian Dysfunction after Uterine Artery Embolization� and was awarded an Army Achievement Medal. Paul and his wife, Jamie and their boys, Paul Guy, almost 3; James, 19 months; and Andrew, four months, will move to Washington DC in July where Paul will begin his residency in radiology at Walter Reed Army Medical Center. Wedneday, June 8, 2005 . . .Devastating news circulated throughout the Island today as residents began to hear of the death of Grand Island, NY resident in Iraq. Lieutenant Colonel Terrence Crowe was killed in the war in Iraq on Tuesday, June 7, 2005. Click for WGRZ News Story. Details as they become available. these photos taken where he is stationed in Iraq, "very close to the Euphrates River." A1C Christopher Wright, a Patrolman with the 56th Security Forces Sq./SFOB, writes that he is back from his deployment over-seas. He was in Kyrgyzstan from September 2004 to March 2005. He is stationed at Luke AFB, Phoenix, AZ. "Back to being a regular cop back on base and am not due to deploy again for a while," Chris writes. Readers, we need your help! If you are the parent or spouse of, or closely related to an Islander who is serving his/her country, please forward information to us so that others may boost their spirits by writing to these men and women fighting for our freedom and serving their country. Send us a photo of your serviceperson in uniform with his/her rank and service, full name, where stationed, year graduated from Grand Island High School if this applies, and an address (email and/or U.S. mail) where we may write and let them know how proud we all are that they have volunteered to protect our country. Information may be mailed to teddy@giecom.net or sent through by U.S. mail C/O Teddy Linenfelser - Isledegrande.com, 1871 Whitehaven Road, Grand Island, NY 14072. For this column to work, it is also very important that servicemen and women and their families update the biographies and especially the mailing addresses and ranks that have previously been submitted. Changes sent to teddy@giecom.net will be made immediately. Scroll down the page to the biographical information and then email any changes to me at teddy@giecom.net. Additions to this page will be gladly accepted by emailing information and photos to teddy@giecom.net. The US Navy recently announced that John Cunningham was officially pinned Senior Chief aboard the mess deck of the USS Doyle (FFG 39). This promotion to E8 is one step away from the highest enlisted rank in the US Navy, Master Chief. Senior Chief Cunningham's official title is now STCGS(SW) John Cunningham. John is the son of Rita Class of Riverdale Drive. He and his wife Sherri with their children, Laura and Nicholas, are homeport in Jacksonville, FL. Click photo for "full" view. SrA Brent Helman arrived at Osan AB, Republic of Korea on March 11, 2005. He is assigned to the 51 Security Forces Squadron. His duties include Entry Control to the installation and restricted areas, and police/security patrols. Also, his flight is tasked with Mobile Reserves, LP/OP's, and confrontation management (Riot Police). On May 20, 2005, SrA Helman graduated from the advanced Electronic Security Systems administrators course, Commando Warrior. He is now a certified operator, administrator, and instructor of ESS/TASS equipment. 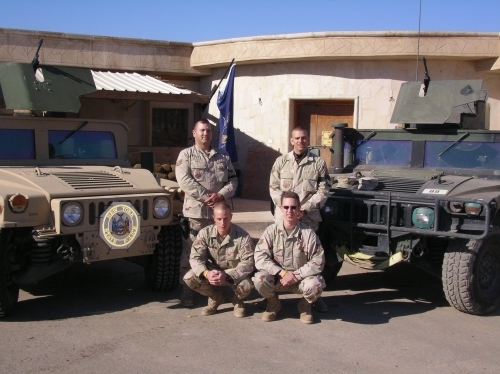 Before his PCS to Osan, SrA Helman spent three years stationed at Malmstrom AFB, MT. During his tour there, he was awarded with four Air Force Outstanding Unit Awards, the Air Force Good Conduct Medal, the Air Force Achievement Medal for meritorious service, the Global War on Terrorism Medal, and the National Defense Medal. He was also nominated for the 741st MSFS Airman of the year. SrA Helman would first like to thank his wife. In many ways, she has it harder than him. While he is away, she has to perform twice the work around the home, and put up with him being half a world away. Next, he would like to thank his family for helping his wife out (when they are in the Montana area), and for keeping strong, even with North Korean tensions building. Last, but not least, all the Island residents for their love and support. STGC (SW) John Cunningham, aboard the USS Doyle, was involved in the April 16, 2005 seizure of 5,000 pounds of cocaine. A team effort included the U. S. Navy, Coast Guard, and U.S. Customs and Border Protection's Office of Air and Marine Operations. For the complete story, to be published in the Saint Petersburg Times, click Operation PANAMA EXPRESS. John is a member of the Grand Island High School Class of 1987 and son of Rita Class of Riverdale Dr.
SrA Michael J. Golden's new email address is MICHAELG@SEYMOURJOHNSON.AF.MIL. SrA Michael J. 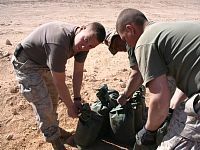 Golden returned to the states in February 2005, following a five-month deployment in Iraq, thus completing his second tour of duty. Michael's plane arrived at the Buffalo International Airport late Monday evening, February 28, 2005 following a lengthy delay in NYC due to the snow. He was able to spend a short visit on the Island with family and friends. He will return to Seymour Johnson AFB in North Carolina, where he resides with his wife, Heather (Brenon), also formerly of Grand Island, and their 3-year-old daughter, Crystal. Michael's mother, Marlene (Vinovrski) Golden, and the Golden family wish to thank the local community and businesses for their thoughts, prayers and support. U. S. Air Force Senior Airman Brent M. Helman is serving duty at Osan Air Base, South Korea. Brent has been serving in the military for four years and is an entry controller assigned to the 51st Fighter Wing. He is married to Delene Collins Helman, who is also serving in the U. S. Air Force. Brent is the son of Kenneth Paul and Pamella Helman of Grand Island. United States Air Force troops SSGT James Balcom, SSGT Patrick Buell, SSGT Adam Harvey, and TSGT Randy Schenefiel are returning home from Iraq on April 1, 2005. They will be flying into the Greater Buffalo Niagara Airport on Friday, April 1st at approximately 6:50 p.m. It is hoped that the Island will support their homecoming with a great welcome by Isle well wishers at the airport. The Grand Island Moose and the 107th Motor Vehicle unit are planning a welcome home party May 14, 2005 at the Grand Island Moose Lodge. 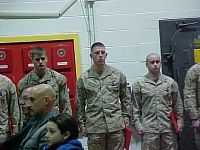 All four are with the 107th Air Refueling Wing at the Niagara Falls Air Base and were deployed to Iraq in October 2004. 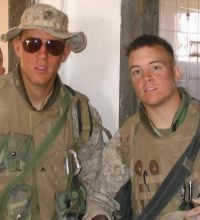 SSGT James Balcom and SSGT Patrick Buell are Grand Island residents. have returned to Grand Island for a surprise Easter visit from Ramstein AFB, Germany. Danielle is a graduate of Grand Island High School, Class of 1997 and joined the service after graduation. 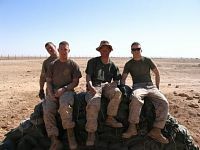 Lance Corporal Michael Mehltretter, United States Marine Corps finished training in 29 Palms, California and has been deployed to Iraq. He is presently in Al Asad Airbase west of Baghdad and two hours south of Al Hadithah. 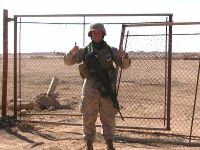 Lance Corporal Michael Mehltretter, United State Marine Corps finished training in 29 Palms, California and has been deployed to Iraq. He is presently in Al Asad Airbase west of Baghdad and two hours south of Al Hadithah. This is A1C Delene Collins Helman. I graduated from GIHS in 2003 and left for basic training about a month or so later. Last year I wed SrA Brent Helman also from Grand Island; class of 2001. Currently we are both Security Forces members who specialize in the protection of nuclear weapons and are stationed here at Malmstrom AFB, Montana; however, Brent will be leaving here in the first week of March, to serve a 1 year tour at Osan AFB, Korea. After that, both of us will PCS to Ramstein AFB, Germany and will be stationed there for approximately 3 years. That�s the latest update so far. I know my husband has written his thanks to your website, but I thought I�d take this opportunity to express mine. I appreciate what you are doing so much. It is heartwarming to know that we have the support of our hometown. It is also convenient to keep in contact with others who have also left for the military. Hopefully soon we will also have some pictures for you to add. No matter where in the world the military will take us, Grand Island, New York will always be our hometown; and I am grateful that you allow us to stay connected to it. Chief Petty Officer, James D. Baldwin, son of Lorraine Baldwin and the late Donald Baldwin of Grand Island, retired from 22 years of honerable Naval service in a ceremony onboard the USS Anzio, a Norfolk based guided missile cruiser. Chief Baldwin enlisted in the summer of 1982 and served in a number of assignments including; Rota, Spain; Keflavik, Iceland; Seoul, Korea; and Tuzla, Bosnia in addition to the guided missile cruisers, Wainright, Yorktown, Biddle, Cape St. George, and Anzio. He also served onboard the aircraft carriers Saratoga, Dwight D. Eisenhower and Coral Sea. While serving onboard the USS Anzio in the Middle East, Chief Baldwin's unit engaged the enemy at the outset of hostilities in Iraq. Chief Baldwin will remain in Virginia Beach where he will teach school. Grafenwoer and Hohenfels, Germany over the past year provided some very realistic training. 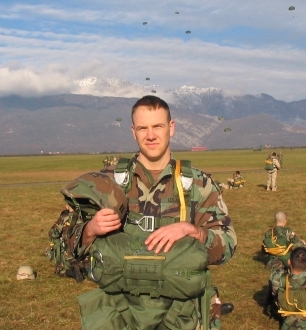 The photo is of Jon's most recent airborne operation in Northern Italy. Cpt. Monti is serving as a physician assistant with the 173rd Airborne Brigade. are all enlisted in the New York Air National Guard, assigned to the 107th Air Refueling Wing. area and do not see any deployments in the near future. 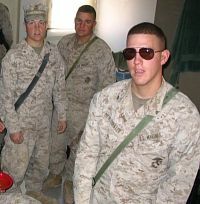 in 29 Palms, California before deploying to Iraq in February or March 2005. Chief Master Sergeant (CMSgt) Keith Coffey has been serving in the United States Air Force for the past 38 years. CMSgt. Coffey is the Maintenance Superintendent for the 914th Maintenance Squadron, Niagara Falls Air Reserve Station, New York. He is responsible for the Avionics, Fabrication, Support Equipment, Propulsion, Accessories, and the Aircraft Inspection and Repair sections for the Maintenance Squadron. He has been a member of the 914th for the past 33 years and has served all over the world including deployments to the Middle East to support Operation Desert Storm and Desert Shield, as well as Operation Enduring Freedom. CMSgt. Coffey, his wife Carolyn, and three daughters, Cindy, Candy and Trina and their families all reside on Grand Island.